In this week's "Drone Sunday" post from From Where I Drone, a caravan of camels is herded across the Australian Outback, casting shadows on the barren terrain. Between 1870 and 1920, roughly 20,000 camels were brought to Australia from India, Afghanistan, and the Arabian Peninsula. Today, the country's feral camel population is between 1 and 1.2 million, and is considered a nuisance to Outback communities. For more awesome drone imagery, follow From Where I Drone! Our founder, Benjamin Grant, used a drone to capture this view of the Tegallalang Rice Terraces in Bali, Indonesia. Farming with these graduated steps makes it possible to grow crops on hilly terrain and effectively decreases both erosion and surface runoff. 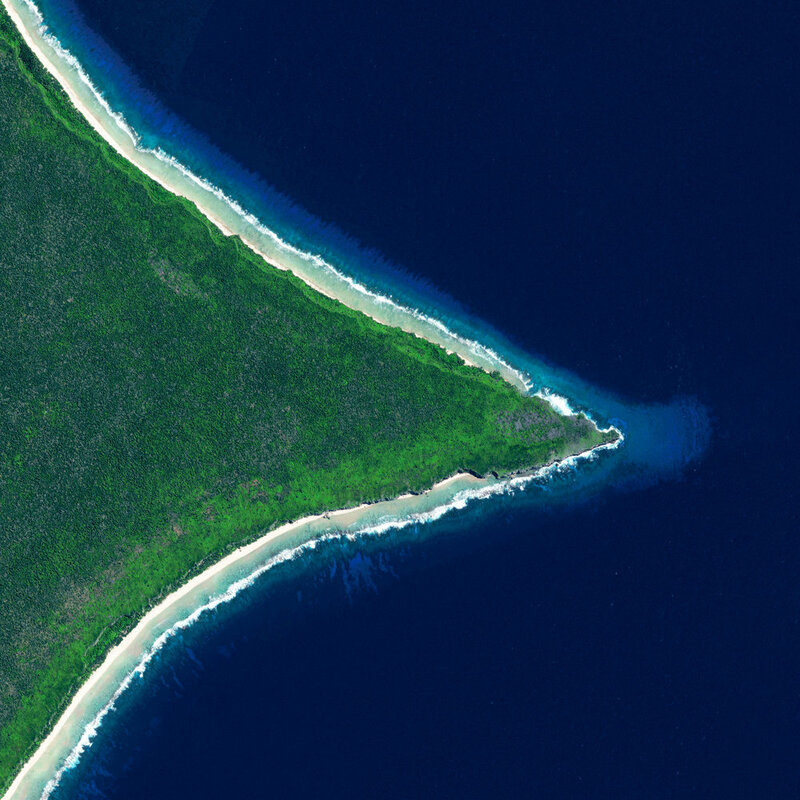 Henderson Island is a 14.4-square-mile, uninhabited landmass in the South Pacific Ocean. Recent studies have shown that this area has a higher density of plastic wash up on its shores than any other place on the globe. It is estimated that the island’s shores now contain 37.7 million items of debris, weighing a total of 17.6 tons. Salt deposits marble the shoreline of Lake Coipasa in Bolivia’s Sabaya Province. At an elevation of nearly 12,000 feet (3,657 m), the lake is fed by the Lauca River, which drops dark volcanic sediment along its northwestern shore. That sediment, shown on the right side of this Overview, contrasts sharply with the light blue water and white salt crust. The Richat Structure, also known as the “Eye of the Sahara,” is a prominent circular feature in the Sahara Desert of west-central Mauritania. Measuring 30 miles (50 km) in diameter, the structure was originally thought to have been formed by the impact of an asteroid; however, it is now known to be an eroded structural dome of layered sedimentary rocks. Check out this beautiful image of “Cherry Blossom Avenue” in Bonn, Germany. Every spring, this street — officially known as Heerstraße — is transformed into a bright pink tunnel as ornamental Japanese Cherry Blossoms bloom. The trees were planted in the 1980s and attract thousands of tourists every season. Hundreds of vehicles are parked in a processing lot near the Port of Philadelphia, Pennsylvania. Since 2010, hundreds of thousands of Hyundai and Kia vehicles have arrived at “PhilaPort” — located on the Delaware River — aboard cargo ships from South Korea. After processing, these vehicles are delivered to dealerships across the country by truck and by rail. Check out this week’s “Drone Sunday” post from From Where I Drone, which shows the Cát Bà Archipelago in northern Vietnam. It is made up of 367 islands that span 100 square miles (260 sq. km) in the southeastern edge of Lan Ha Bay. The largest island — also called Cát Bà — has roughly 13,000 inhabitants, with an additional 4,000 people living on floating fishing villages off the coast. On Thursday, cyclists racing in the Tour de France completed Stage 12 of the race, passing through the 18 hairpin turns of the Lacets de Montvernier in Montvernier, France. 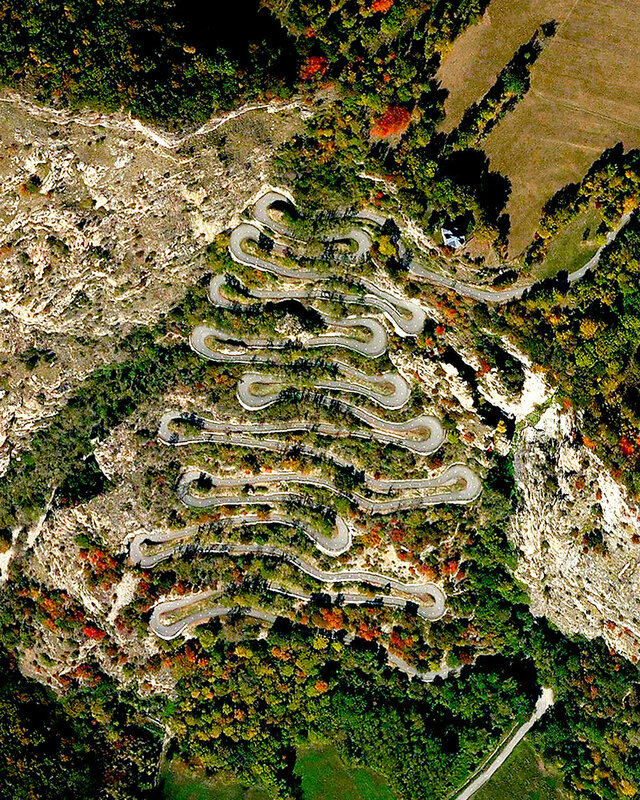 This spectacular climb is 2.1 miles long (3.4 km) and contains a switchback turn every 450 feet (150 m). Welsh cyclist Geraint Thomas, racing for Team Sky, won this stage in just under five hours and 20 minutes. Rub’ al Khali — or “The Empty Quarter” — is the largest sand desert in the world. It covers 251,000 square miles (650,000 sq. km) and includes parts of Saudi Arabia, Oman, Yemen, and the United Arab Emirates. In the center of the desert there are a number of raised, hardened formations that were once the sites of shallow lakes, thousands of years ago. Keyhole-shaped tumuli are scattered throughout the city of Sakai in Japan's Osaka Prefecture. A tumulus is a mound of earth or stone raised over a grave, and the largest one shown in this Overview is the final resting place of Emperor Nintoku. Nearly 1,600 feet (486 m) long with a mound 115 feet (35 m) high, it covers the largest area of any tomb in the world. A frozen river is seen here in Kujalleq Municipality, Greenland. At 12,355 square miles (32,000 sq. km), Kujalleq is the smallest district in Greenland by area. Its coat of arms features a ram’s head, which symbolizes one of the area’s most important economic assets — sheep farming.